This is a brand new mission and a new entry into the accountant series. There are some different than usual puzzles in this FM, so if you find yourself stuck try to think about your pathway forward in a logical manner. And if you're still having troubles then pop by this thread and ask (preferably with spoiler tags). This FM is brand new and serves as the first installment in The Accountant series, a few years back there was a small prologue style mission released however I felt that it did not represent The Accountant series so I decided to go back to the drawing board and do a whole new mission that's both larger, has better level design and has a story that lines up closer to what I plan to do with the accountant series. The mission is medium sized and you can expect between 30-90 minutes to complete it depending on your playstyle. Downloader fails when I try to download this. It works fine on my end, got a friend to try it and they had no problems either. Try it again and if it still doesn't work maybe try the mirror link in the OP. You just have to drop that .pk4 file into your FM folder and you're good to go. Does this completely replace the old version..? it would be worth keeping this for posterity and all the work that was done on it by us. This mission is the first in the accountant series now, it replaced the old first entry to the series I released back in 2014. 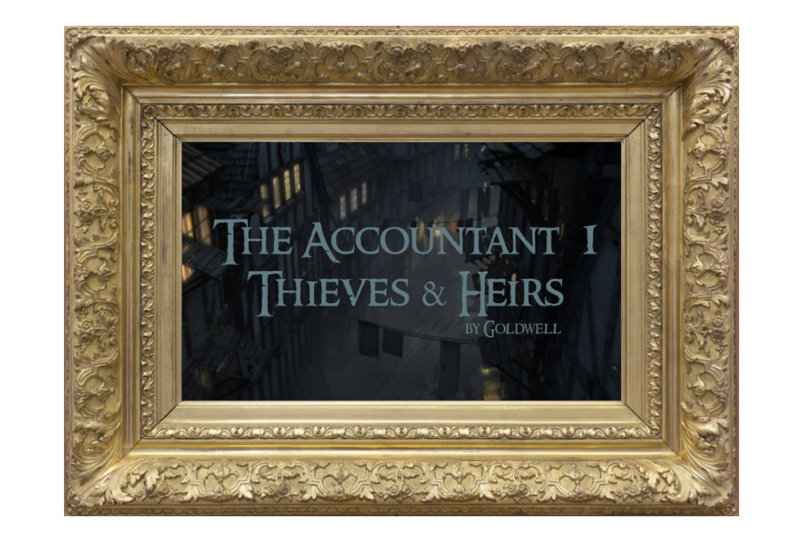 The old prologue mission is no longer relevant to my series so there is no point in keeping it around as now there is the accountant 1: Thieves and Heirs. Edited by NeonsStyle, 08 November 2017 - 10:00 PM. So the old prologue - that mission was removed from the in-game downloader a while back. You say the old prologue mission is no longer relevant, but are there any elements of the prologue (story, environments) that got put into this mission or is the prologue completely pointless now? If so, I kinda agree with the idea that it might be worth re-releasing the prologue as sort of an "extras" mission with the clear distinction that it no-longer is part of the series. Up to you of course since you did all the world, but it was a nice mission, had some good voice work and was of course well made like your regular work. I'd hate to see all the effort just disappear from the Internet. It doesn't even need to be in the in-game downloaded, maybe just a link here or something for posterity. Anyways, gonna give this a crack, so thanks! The simplest way to look at it. The old prologue is version 1.0 and this new mission Thieves and Heirs is version 2.0. The concept that I originally came up with back in 2014 is still all here. You meet a fence down in a sewers and have to steal a necklace for him in a rainy city mission. However the level itself is completely different and there are characters in this who will become relevant later in the story. As I work on the accountant 3 it became more and more clear to me that this new mission should be the first entry in the series. Eventually when the accountant series is finished I plan to bundle all of the missions up into a large campaign and inside that there will include a goodies section. In that will be an unreleased accountant mission which I made before turning the series into a campaign and the old prologue mission too. So for those who are interested can dig it out and play it. For now though I would like to focus this thread on my new mission please. I put a lot of hard work into it and as did my beta testers too. Just finished it up. Short sweet and to the point! I especially loved the voice scene in the sewers about the spiders. Fun bit of comedy that really tied that section together well. Unfortunately, I came up 40 short of the required loot goal on Expert, and after 15min of loot hunting, I gave up. Great mission! I absolutely loved it! "Somebody should put up a note about the spiders down here." I laughed so hard at that convo. Just like with the Accountant 2, loved the small, yet important environmental details, the excellent voice acting, and of course, the creepy spiders. Found most of the loot, and 5 out of the 6 secrets on Expert. Looking forward to playing it again to see what other tidbits I can find. My one bit of critique, and its small, is: More readables please! Readables are why I play the game, ha. I'd love to be able to learn what the alchemist is up to, and why the guy in the electric tower killed himself. I'd love to have a bit more backstory in those regards. Other than that, absolute quality FM! Way to go! Wow, what a fantastic mission. Loved each and every moment especially having to look for the secrets. The environment, the lighting and the attention to detail (like the raindrops on the windows) made it seem so immersive. The brilliant and humorous voice acting really engaged me as well. I really can't wait for more. Bravo! Was going to ask about that but felt a bit silly, glad to hear they survived the rework! Excellent revision! I liked the original (the mood was neat and some of the set-pieces were already showing Goldwell's skills), but this is something else. It is all more expansive and significantly better-looking, with a consistent mood and some very clever puzzles. I liked how you reused the locations of the first version while expanding on them. The two would be pretty cool to enjoy side by side to see how one evolved into the other. I missed exactly 400 loot, and achieved a stealth score of 15. Certain locations gave a strong 'classic thief' vibe, others were very 'Melan' in thier claustrophobic and/or macabre setting. A couple of mapping mapping bugs but overall, a good mission. How much of the new models and textures are now part of 2.06..? Completed in 30mins, 500 short on loot stealth score of 9. For the level though I actually didn't keep or reuse anything from my old prologue FM except for a window rain texture. I started Thieves and Heirs with a blank map and built it all from the ground up. Hi Goldwell, congrats on a terrific mission! I just wanted to get some sleep before work, check up the status on the forums to see what's happening, and before you know it, I'm playing this until 3 am (I had to finish it NOW, sleep be damned). Like the overall Dark mod theme, with the claustrophobic streets and high towers. What actually amazed me is the performace on this one. I have a laptop with relatively weak individual cores which tends to create problems for me when playing the TDM. Throughout this mission, the only place where I noticed considerable framerate drop was while rendering the cone of frost in the cold storage, which I blame on the particle effect and not the map, of course. The rain effects are splendid, especially the sounds in the greenhouse and the small ripples on the waters all along the street floors. All in all, an instant classic. By the way, is the lord a cannibal, or is the cook secretly feeding him human parts without his knowledge? He did complain about the staff and their services being not to his liking, so I guess they could be hiding something from him as well? Am I overthinking this one? I didn't find anything about his preferences in the mission other than the fact that he likes "hunting" mentioned in his study, which could be a subtle indication of his tastes, but nowhere else are his preferences implied (this reminds me of the town I used to grow up in, with the hunting lodge once being in the middle of the forest, but over time with the settlement growing out far enough to encase the lodge completely within the settlement; seeing details like this cold storage sends a shiver down my spine when I consider the implication of us joking on so many occasions about the hunters having to shoot people now living around them since they have nothing more left to hunt). Also regarding the readables, I've noticed a guy in the working class sleep bunks have a diary that seemed to be readable, but is in fact not. Is it just a clever skin over the book that almost seems like it has letters that can be read, or is it a bug that prevents the book from being targeted? Also, couldn't help but laugh as I cut the inventor's guild rope and the rope was severed but he was left floating in the middle of the room. In his defense, the windows around his room are gorgeous, so it was still a pretty, if a tad macabre, sight. Edited by Silverflame3, 10 November 2017 - 03:24 AM. - it is possible to get out of the map by climbing early on the rooftops and then getting over a wall (https://imgur.com/a/nEOn6).You can still climb back, however, while there you can already encounter pre-spawned NPC - the contact, you were meant to meet in the sewers. If you get close enough to him, he will start opening his mouth, but no sound is coming out of them. If you will now carry on with the mission like normal, when you encounter him in the sewers, his speaking animation will get shorter by the amount you saw while out of the map, meaning that after a certain point till the rest of his monologue, sound file will play but he will not move his mouth. - Spiders in the sewers - when one of them accidentally climb atop of the chest, his leg pushed the treasure inside, causing noise, which attracted them. Basically, once they turned it on, they couldn´t get off the chest, trying to get to the source of the sound while making new one by moving themselves. + attention to detail: rain! Rain on the window glasses, wet surface of the roofs, eaves flowing with water - I don´t remember any other mission with such atmospheric rain. I had 4 out of 6 secrets, have no idea where the last 2 are, i was missing 370 gold pieces and it took me about 1:51 hours to finish the game. Edited by Tarhiel, 11 November 2017 - 10:45 AM. LOL that spider chest bug cracked me up. I was wondering why the loot kept getting moved around... Well there's that mystery solved! Very nicely done mission. Thank you.